Alyx work with beads and metals using weaving and cold connections. 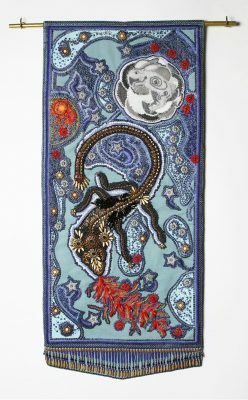 The majority of her work is jewelry but she has also done wall-hangings and small sculptures. Her work has been displayed internationally. She is the author of 26 Quick-Stitched Elements: Endless Jewelry Possibilities (Kalmbach, 2015) and her designs have been published in trade magazines (Bead & Button, Beadwork).